Articles of Confederation, the predecessor to the Constitution. However, when an agreement was made to add a "bill of rights" to the Constitution, Henry fought hard for its ratification. The term "framers" is sometimes used to specify those who helped "craft" the Constitution. "Founding Fathers" often refers to people who contributed to the development of independence and nationhood. However, the notion of a "framer" or a "Founding Father" is not easily defined. For purposes of this website, "Founding Fathers" are individuals who had a significant impact on the Constitution either directly or indirectly. The following list is by no means complete, but it does identify people who played a large role in the development of the Constitution at this crucial time in American history. The staid portraits of George Washington accurately reflect the personality of the father of the nation. He was a man of few words, whose political ascension was attributable to his strength of character, rather than his intellect. A huge man for his day, Washington stood 6' 3 1/2" tall with enormous hands. Washington had pockmarked skin as a result of a teenage case of smallpox, and a shy disposition that was the result of a domineering mother. Twice he proposed to women, and twice he was rejected. He finally married Martha Custis, the richest widow in Virginia. He had lost almost all his teeth by the time he was president, leaving him with badly sunken cheeks that were stuffed with cotton for portraits. 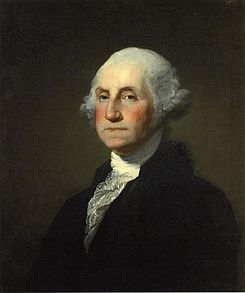 Contrary to popular belief, George Washington never had wooden teeth! His teeth were made mostly of lead fitted with human, cattle, and hippopotamus teeth. Some were carved from elephant and walrus tusks. In his will, he freed all 300 of his slaves permanently. The popular tale of Washington and the cherry tree, historians say, was almost certainly untrue. His Politics: Washington was a Federalist, so he favored a strong central government. He also had a strong affinity for aristocrats. During the Constitutional Convention, he spent much of his time at the mansion of Robert Morris, the richest man in America. His closest political ally was Alexander Hamilton, whose policies inevitably leaned toward the upper classes. Washington was the only president to win unanimous approval (all of the votes cast) by the electoral college. He did it twice.